The Formax Letter Openers are very fast and very easy to use, they have been designed for faster cutting of envelopes while also at the same time keeping the content safe and undamaged. 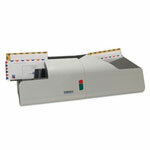 These letter openers can open envelopes of variable sizes as they have an push arm feature which helps in efficient and accurate production. They open the envelopes with a speed of 300 envelopes within one minute which is quite fast and effective for any business. They are perfect for all time high production. The Formax Letter Openers save a lot time and enable us to do other tasks which hold higher priority.